The pressure bag made of Polyvinyl chloride with Pressure gauge and three-way stopcocks at the end inflating balloon will be present for giving pressure. The pressure cuff indicated to rapid fluid replacement in patients like trauma, blood loss, Fluid replacement therapy etc. The pressure cuff bag used in the monitoring of continuous arterial and venous pressure monitoring. Its used in the diagnostic laparoscopic procedure in gynecology and for lavage. In Urology the procedures like Ureteroscopy, resectoscope the pressure cuff bag is used frequently. Release the air inside the pressure cuff bag. 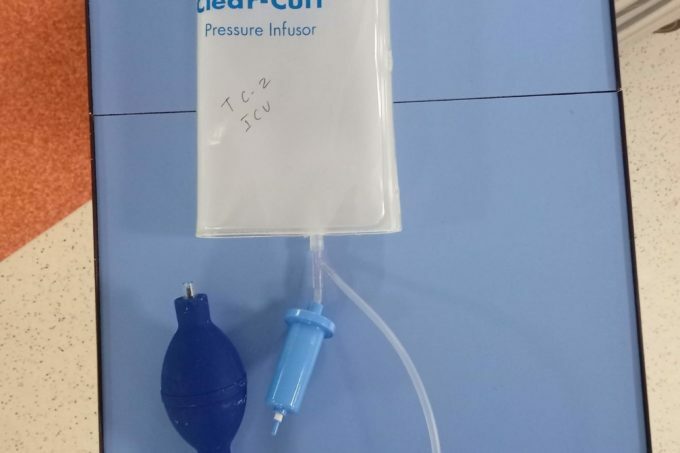 Keep the fluid contained inside the pressure bag and hang it the IV stand. Turn off the stopcock to close the port that releases the air out. Squeeze the air bulb to inflate the pressure bag to the recommended pressure. The recommended pressure limit marked as green and exceed the limit marked as the Red color. Don’t inflate over the recommended pressure or over inflate. Use only the pressure inflating the balloon for the inflation of pressure bag. Overinflation of the pressure, the bag may result in damage to the pressure bag and burst of particular lavage solution. For a long life do not avoid spillage of fluids and solution contacts. Once it reaches the desired pressure close the valve using stopcock to avoid leaking of air. Do not soak or immerse in any disinfectant solution or in tap water.